Petrochemicals group Ineos is in discussions with BP to buy the important Forties Pipeline System in the North Sea, according to news reports. Ineos depends on the Forties system for its Grangemouth refinery, which it bought from BP in 2005. 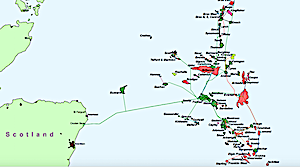 The Forties pipeline transports the equivalent of 40% of UK production from the North Sea. The pipeline system has played a major role in the development of the central North Sea for the past 25 years. “BP can confirm it is in discussions with Ineos regarding a potential sale of the Forties Pipeline System,” said a BP spokesman.